The Hamilton General Hospital serves as the Regional Trauma Centre, the Regional Stroke Centre and Regional Neurosurgical Centre for Central South Ontario (including the Hamilton Niagara Haldimand Brant LHIN and Waterloo-Wellington LHIN), serving adults in an area of 2.2 million residents. We are regarded as being a leader in stroke care provincially and nationally. Hamilton General Hospital is one of five Neuroscience Centres in the province which has been designated for minimally invasive neurosurgical procedures. 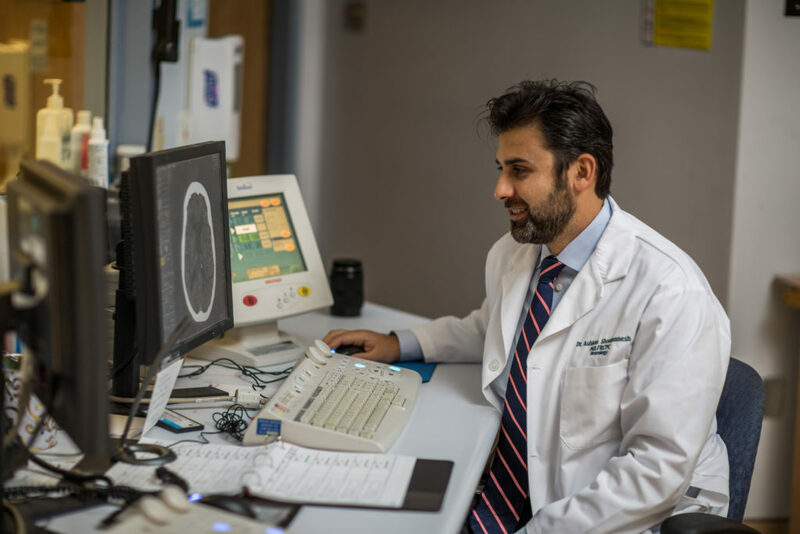 The Regional Stroke Centre for the Central South Ontario Region is located at Hamilton General Hospital with the mandate to provide tertiary level stroke care within the Central South Ontario Region. It is one of 11 regional centres established across the province to implement the Ontario Stroke System. The goal of the Ontario Stroke System is to improve access to evidence-based prevention and care in order to reduce stroke incidence, mortality and residual disability. The system seeks to re-organize stroke-care delivery across the continuum of care, promoting system-change, professional education and public awareness. Visit the Central South Regional Stroke Network website for more information. Hamilton Health Sciences is a member of the Neurosurgery Education and Outreach Network (NEON) which is led by Critical Care Services Ontario (CCSO). NEON is comprised of Neurosurgical Nurse Educators (NNE), Clinical Outreach Specialists, Advanced Practice Nurses and Hospital Administrators. The purpose of NEON is to support system-wide improvements in Neurosurgery Services through education and outreach in hospitals throughout Ontario. The NEON team at Hamilton Health Sciences provides neurosurgical nursing and education support to our community hospitals in the Waterloo Wellington and Hamilton Niagara Haldimand Brant Local Health Integration Networks. The aim of NEON is to support patient management, develop repatriation strategies, provide education and improve quality of care within our neurosurgical center and referring non-neurosurgical centers.